The autumn equinox arrives on September 23 at 12:50 am PDT. While the summer constellations sink into the western horizon, the autumn constellations start to rise. By midnight, they are overhead. The autumn sky lacks the bright stars of the summer and winter skies which can make identifying individual constellation a challenge. 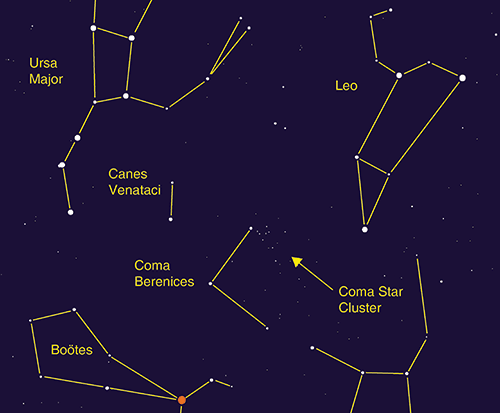 At the heart of the autumn sky is six constellations telling the ancient Greek story of Perseus and Andromeda. The players depicted in their celestial spheres are: Andromeda, fair maiden chained to the rocks. Cetus – the terrible sea monster for whom Andromeda is a snack. King Cepheus and Queen Cassiopeia watch on as their daughter is sacrificed. The winged horse Pegasus brings our hero Perseus, holding the Medusa head and brandishing his sword, to the rescue. to be part of our Milky Way and thus was a galaxy onto itself. Opposite M31 and its guide stars is M33 in Triangulum. M33 is a large pin-wheel spiral galaxy. The large “W”, north of Andromeda, makes up the constellation of Cassiopeia. Between Cassiopeia and Perseus is a favorite of binocular and wide field scopes, the Double Cluster, NGC 869 and NGC 884. Also in Perseus is the Demon Star, Algor, who’s regular eclipses in its multistar system cause Algol to change in brightness giving to the notion that it was demonic. Cepheus is a rather non-descript constellation is near the north pole. Finally, the water constellations: Aquarius, Pieces, Cetus and Eridanus make up the rest of the autumn sky though they are not very bright. Mercury will transit the Sun on November 11 at sunrise giving us a chance to see the planet move across the Sun. Afterwards, Mercury will return to the morning sky. Venus will just be starting its entry into the the evening sky. Look for it in the west after sunset. Mars will be too close to the sun to observe in the dawn. Jupiter and Saturn will exiting the evening sky as fall progresses. Look for both in the west setting between 2-3 hours after the sun. Uranus will be at opposition on October 28 in the constellation Aries. Neptune is in the evening sky in the constellation Aquarius.